Ladies and Gentlemen, the time has come to end this war. 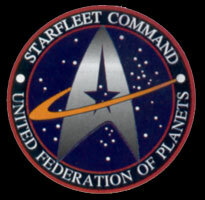 Recently Captain Stewart who was caught behind enemy lines, was exfiltated back into UFP Space. She brought back with her, the Cardassian Military transponder codes. We Can now track all Cardassian vessels from behind out own lines. This is our target, the Bajoran Sector. For nearly 40 years the Bajorans have been under occupation by the Cardassians. We will liberate their world. 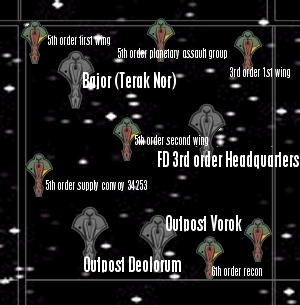 As you can see this sector is heavily defended 3 tactical wings, and a Planetary assault group are stationed there. Our First goal, will be to draw as many ships, away from the sector as possible. Nova Squad will attack the Cardassian out post in system SD422. Omega Squad will atack the Cardassian Shipping route through the Folok nebula. I will lead Epsilon squad, in a direct assault on Dreon. This will hopefully draw most of the tactical wings, away from Bajor. The Bajoran Resistance will attack the outer patrols of the Bajor System. This is to draw as many ships away from the Bajor homeworld as possible. 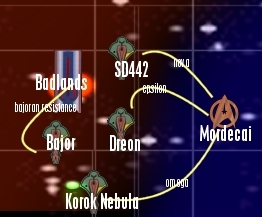 After the diversions are placed all three squads will warp into Bajor. We will first destroy the Nor type mining station in orbit of the Bajoran Homeworld. Then destroy any squads left in system. The 3rd battlegroup will reinforce us with ground troops after the system is secure.